Some would call broodje rookworst the Dutch answer to the American hot dog (with far superior sausage, that is), but this sandwich is not served at football stadiums or street vendor style. You'll find it sold seasonally alongside snert, broodje bal, mulled wine and chocolademelk at Dutch koek en zopie (refreshment) stands at ice skating rinks in the heart of winter, and there are few things more satisfying to warm one up on a bracing cold day. Place the sauerkraut, wine, butter, thyme, and bay leaf in a saucepan and bring to the boil. Turn the heat down and leave to simmer for 15 minutes, stirring every now and then. Season to taste with salt & pepper and allow to cool. Mix the mayonnaise, mustard, chives, and parsley together in a small bowl. Set aside until later. Heat the rookworsten (see Tips). Cut the sausages on a deep diagonal into thin, broad slices. Split the bread rolls and spread generously with the mustard-mayonnaise. 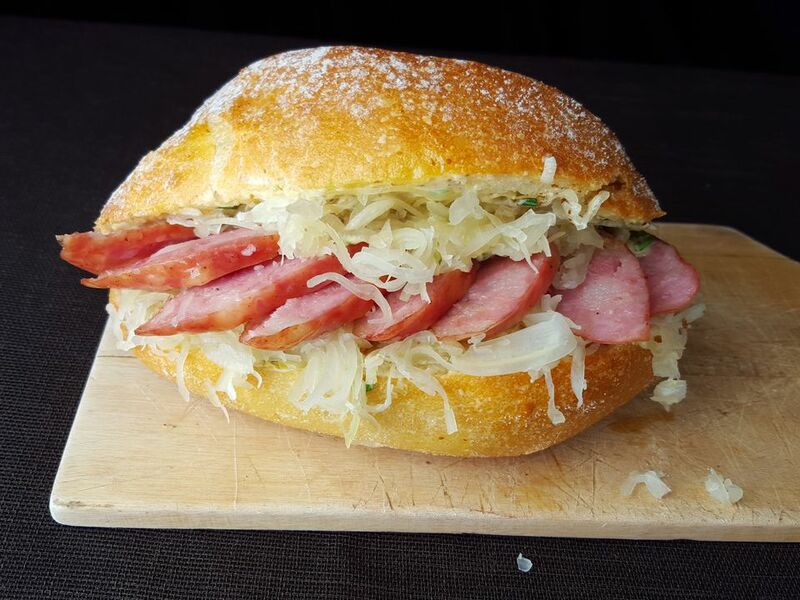 Top with sauerkraut and the slices of rookworst. Serve immediately. As with all simple foods, quality really counts here. If you live in the Netherlands, this is the time to buy quality artisan products: ambachtelijke rookworst from the butcher, old-fashioned sauerkraut from that fancy organic supermarket and good bread rolls from a baker. If you can't find rookworst where you live, why not try to order rookworst online? Dutch smoked sausage (rookworst) is usually warmed in hot water or the microwave, often still in its vacuum-packed sleeve. If you're wary of BPA exposure or simply not a fan of cooking food in plastic, simply take them out of their packaging, cut off the metal bits at the end and warm them in a glass microwave-safe container, with the lid on for a few minutes. Make a meal of it with thick-cut oven fries and an ice-cold Dutch beer. You will have some sauerkraut left over, but do not throw it out. Instead, use it to make traditional Dutch zuurkool stamppot, serve it alongside balkenbrij or enjoy it as part of choucroute garnie. Sauerkraut has long been seen as a vital source of vitamin C during freezing Dutch winters. It is also a good source of flu-fighting vitamin B-6 and iron. With the recent resurgence of everything fermented, this old favorite is certainly worth rediscovering. Why are fermented foods naturally good for you? Like many lacto-fermented foods, sauerkraut is packed with gut-friendly probiotics, which promote a healthier digestive system. These foods are also said to have anti-inflammatory properties and may help to prevent certain types of cancer. Our Chocolate-Coconut Granola is a Healthy Dutch Treat.